As of March 2019, the Santa Fe Western O scale layout measures 170' by 25'(30' on ends, 20' in middle) and occupies over 4000 square feet of our building. Unlike the HO an N scale layouts, O scale is not a model of any particular region, instead it is intended to capture the flavor of the West while providing us with as long a mainline run as possible. We currently have a mainline that is about 27 scale miles, or 2500 feet long, plus over 2450 feet or yard trackage including over 110 turnouts and two double slip switches. Not much by prototypical standards, but certainly respectable for a model railroad. A variety of construction and scenery techniques are evident on the layout. We have a master track plan that were following in the construction. First, a framework of lumber is built to support the layout. For the roadbed beneath the track we cut narrow wood splines that are then glued together. This spline allows us to form very natural sweeping curves, and is very strong. To this is glued a layer of Homasote, a paper product that provides the basic shape of the roadbed to which wooden ties are glued and rails are spiked. Almost all of the track is laid by hand. We then glue ballast to the roadbed to provide a more natural look. To build the scenery we first construct a frame of plywood to form the contours. Over this goes a lattice of cardboard strips, then newspaper, and a layer of Hydrocal, a cement like product similar to plaster of paris. To form rocky areas, we pour hydrocal into a mold, then attach it to the basic shell. After that we paint the bare hydrocal and add a variety of commercial and natural scenic materials to form grass, weeds, bushes, and rocky areas. Trees are a combination of commercial and home made materials. Were always on the lookout for natural scenery materials to use. Buildings and other structures are a combination of scratch built and commercial kits. Most of our membership's primary interest is in standard gauge. Although Southern Pacific represents our single largest unit of equipment, Santa Fe, Milwaukee Road, Pennsylvania, Great Northern, and Western Pacific&NW, and several other heralds are frequently found on the layout. Standard gaugers are an eclectic group. Three yard areas are visible to the public. One is the recently constructed Pt. Richmond passenger terminal yard near the front door of the building. It has four tracks and is designed to handle up to 12 car passenger consists. The Midway yard (a 6 track freight yard) is approximately in the center of the layout. This yard represents the half way point on the layout. Trains can either turn around here and head back to the lower staging yards, or continue up through the Mountain Division to the Zenith yard. Also visible is the Midway Engine terminal and turntable and Diesel Service terminal. 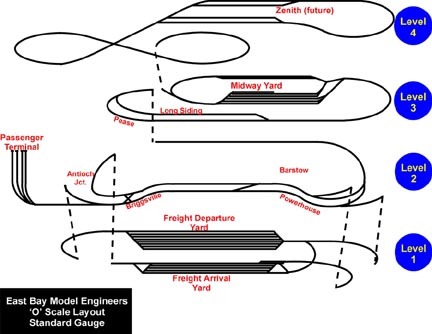 Two additional staging yards -Departure and Arrival-, with a total of 13 60-car tracks, are outside the view of the public. It is here we build and dispatch the trains we run. There is also a staging yard for Interurban line that is hidden from public view. One of the features of this layout is our ability to run very long trains. Our yard tracks and sidings are about 55 feet long, giving us the ability to run trains of up to 50 cars. We have operating positions for about 7 operators to run at the same time. A dispatcher at the Arrival or Departure Division control panels behind the scenes routes power and throws turnouts to allow mainline engineers to run trains on the two lower level tracks using handheld radio control throttles. Another operator controls trains on the Midway Division, which includes the large yard and engine facility in the center of the layout. Here trains can reverse direction and head back the way they came, or continue on up to the Mountain Division and terminate in the Zenith yard, almost 10 feet above the floor. We cam also run with a Passenger terminal operator, a narrow gauge operator, and an interurban operator. With DCC (digital command control) it is much easier for fewer operators to control more trains. All the trains receive control information on the tracks in packets, much like a local internet. Decoders in the locomotives respond to those commands to adjust speed, control lights and sound. At the present time however, we have only a few DCC equipped locomotives. As manufactures produce more DCC compatible equipment this should allow us to increase out DCC roster. The trains are probably the most impressive part of O scale. A long freight train may weigh as much as 75 pounds. Like their prototypical counterparts, O scale trains need time to slow down and stop, requiring that the engineer think ahead. With this much mass, a sudden stop such as running into a dead track, or a sudden start like turning the power on with the throttle open, can lead to expensive damage to cars and locomotives. Since a tumble to the floor can be very destructive to a brass locomotive, we have protected most of the track with clear plastic barriers to keep derailed equipment from falling. Unlike some of the smaller scales, there isnt a whole lot of O scale equipment available at your local hobby shop. Many of the cars and locomotives you see here are highly detailed brass models, or built up from craftsman type kits. As the hobby grows, more true scale equipment is becoming available, particularly 3 rail equipment that can be easily modified to run on our 2 rail layout. Many of our models were built from scratch and have given us 30 or 40 years of service. Most of our membership's primary interest is in standard gauge. Although Southern Pacific represents our single largest unit of equipment, Santa Fe, Milwaukee Road, Pennsylvania, Great Northern, and Western PacificC&NW, and several other heralds are frequently found on the layout. Standard gaugers are an eclectic group. Most of the model trains are owned by the individual members, although there is some club equipment that has been donated over the years. All of the structures, buildings, bridges and scenery are property of the club. Freight trains  Several different freight trains can be spotted around the railroad. Models of older trains, dating from the 1940s through the mid 1960s can be identified by the walkways extending along the car roofs. In the early days of railroading these allowed brakemen to walk along the top of the train to set the brakes by hand. This practice was eventually outlawed, for obvious safety reasons. Older trains will also have a caboose, something we havent seen on most real trains since the mid 1980s. More modern freight trains run without a caboose, instead they have an electronic flashing device attached to the last car which monitors the air pressure in the trains brake system. Modern trains are often made up of inter-modal cars carrying containers or trailers, large boxcars, auto-racks, covered hoppers and tank cars. Passenger trains  A variety of passenger trains make an appearance on the O scale railroad, from modern Amtrak trains pulled by the latest and fastest electric locomotives, to old time heavyweight Pullman trains pulled by steam locomotives. Several version of the Hiawatha may be seen. The Hiawatha ran between Minneapolis/St. Paul and Chicago on the Milwaukee Road at scheduled speeds of almost 100 mph, pulled by a streamlined steam engine! Later versions were pulled by Union Pacific Diesels and painted in Union Pacific Yellow and Gray. We have a modern Amtrak Superliner pulled by three Amtrak locomotives. The Broadway, a Pennsylvania Railroad passenger train can be recognized by its consist of maroon Pullman cars and doubleheaded K-4 Pacific type steam engines. The Empire Builder is a long green and orange Great Northern train pulled by a string of diesels. Another couple of trains making an occasional appearance are the City of San Francisco and the Southern Pacific Daylight. These models were commissioned by the real railroads for the 1939 Chicago Worlds Fair. Over 60 years old, the models still provide reliable service. Also keep an eye out for the Grand Canyon, a famous Santa Fe Railway train. We recently (2007) received a donation from the Carl Dean estate of a 13 car Northern Pacific "North Coast Limited" train with ABBA F3 diesel engines. This train also ran on the Halleck layout. You may not see all of these trains, as our members bring them home and rotate others onto the layout over the course of our run season. At some point we may electrify some parts of the upper Midway and Mountain divisions so prototypical Milwaukee and Great Northern trains can operate. The oil refinery model you see here was built in 1971 for Standard Oil. It is an exact scale model of one of the processing units in the Richmond Refinery. Scale models like this are used as part of the construction process to help visualize the relationship between all of the parts of the plant and make sure it all fits together. This is one of the few cases where the model was actually built before the prototype! The model was donated to the Golden State Model Railroad Museum by Chevron.